Palestinian medical sources have reported that a Palestinian man was injured after being hit by a settler’s car, while working in Beitar Illit illegal settlement, near Bethlehem. The sources said that Sha’baan Abdullah Qandeel, 32, suffered various bone fractures and bruises, and was moved to the Arab Society Hospital and Rehabilitation Center, in the nearby city of Beit Jala. Qandeel is from al-Azza refugee camp, north of Bethlehem. Beitar Illit settlement was built on Palestinian lands that belong to residents of the villages of Husan, Nahhalin and Wad Fokkin. Besides international campaigns to boycott Israel’s illegal settlements in occupied Palestine, and despite local campaigns, many Palestinian workers are pushed to work in there, mainly in construction, due to high unemployment rates, and law income, in the occupied territories. Groups of Jewish Israeli settlers vandalized, on Tuesday, a church in the Galilee region and a mosque in the Haifa district. Also on Tuesday, settlers built illegal structures on Palestinian lands in both Tulkarm and Bethlehem. Tabgha church is located on the northwestern shore of Lake Tiberias, in the Galilee, where settlers smashed the cross and vandalized the church pews. On Monday night, a written threat was given to the housemaid of Catholic bishop Giacinto-Boulos Marcuzzo, by a militant from Safed, stating that they have until May 5th to evacuate the so-called ‘land of Israel’, or pay dearly in lives. Furthermore, Massʻoud Ghanayem called for organizing district demonstrations in either Tel Aviv or Jerusalem, in protest of the Israeli government’s inaction in deterring attackers. At daw, in Fureidis village of the 1948 occupied lands, Israeli settlers from the Price Tag gang spray-painted racist slogans against Arabs and Muslims on the walls of Al-Rahman Mosque. 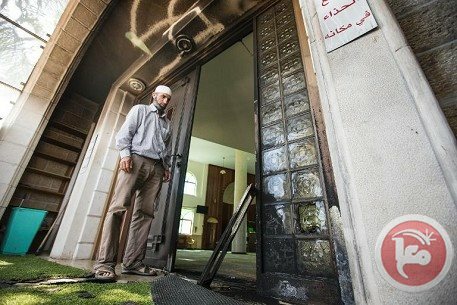 The graffiti called for turning mosques into holy places for Jews. Also found painted was the six-pointed Magen David star. Israeli police spokesman Micky Rosenfeld told AFP, "The tires of several cars parked nearby were slashed," adding that "crimes committed for nationalist motives are extremely serious." Israeli police claim they initiated an investigation, saying that they would work towards arresting the vandals and bringing them to justice. 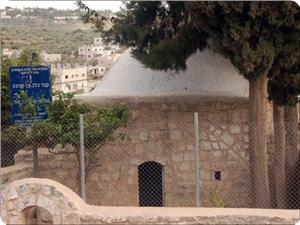 Fureidis is a Palestinian village located at the foot of Mount Carmel in Haifa district. It is one of the few Arab villages on the Israeli coast which remains intact after the 1948 war. Less than two weeks ago, suspected Jewish vandals set fire to a mosque and tagged walls with racist graffiti in Umm al-Fahm. A week earlier, vandals sprayed anti-Christian graffiti on the walls of a convent, just west of Jerusalem, where they also damaged vehicles in the area. "Mary is a cow," "price tag," and "America (is) Nazi Germany" were found sprayed in Hebrew on the walls of the sanctuary. Vandals slashed the tires of more than 40 cars in East Jerusalem, in March, spraying: "Gentiles in the land are enemies." The perpetrators of violence against Palestinian communities are rarely prosecuted, according to Ma'an. There are hundreds of racist attacks against Palestinians in Israel and the occupied West Bank every single year. In related news, Israeli settlers began the construction of a shed, on Tuesday, on Palestinian land to the south of Bethlehem, as a prelude to a new land grab, according to Hassan Burejeyah, coordinator of the anti-settlement committee in Bethlehem. He said that settlers from the illegal settlement of Avrat, under army protection, stormed a private-owned ranch in Khallat An-Nahlah, near Bethlehem, and began constructing a small room out of wood and tin. The owner of the ranch, one 55-year-old Mohammad Ayesh, tried to prevent the settlers from invading hos propery, but soldiers took his identity card and kept him there for hours, said Burejeyah. He said that the escalated attacks by settlers against Ayesh's land continues for the third day in a row, now, with the aim of expanding the nearby settlement. Also on Tuesday, settlers from Avnei Hefets and Einav erected a tent at the entrance of Jubarah village, to the south of Tulkarm, where they raised the Israeli flag over the structure, witnesses reported. 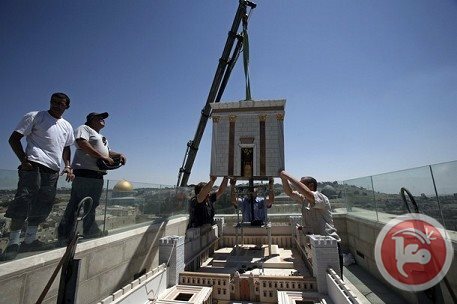 The Aqsa Foundation for Endowment and Heritage, active in the defense of Islamic holy sites, warned of the inauspicious upshots of the recent calls made by the Israeli temple organizations to hold an emergency meeting on Tuesday evening under the slogan "let’s restore the Temple Mount." The meeting aims to address all possible ways to escalate Jewish desecration of holy Al-Aqsa Mosque via pre-arranged mass break-ins as a means to make up for the latest “Easter breakdown” and failure to perform Jewish provocative rites within the mosque. The Foundation said in a press release on Monday the meeting will be attended by the notorious Israeli minister Gilad Erdan, Minister of Housing and Settlement, Uri Ariel, Deputy Defense minister Danny Danon, Knesset deputy speaker Moshe Feiglin, and Knesset’s interior committee chairperson Miri Regev, along with other disreputable Israeli extremist journalists, fanatic rabbis and Knesset members. The projected meeting will discuss the latest al-Aqsa news and the possible ways to catch up on the recent break-in fiascos along with feasible tactics to carry out desecration plans targeting al-Aqsa on Wednesday morning. Israeli Occupation Authorities (IOA) are paving the way for mass incursions into al-Aqsa and reiterating their overzealous determination to deny the Muslim congregation and students’ access into their holy site, the Foundation underlined. “IOA’s desecration scenarios seem to be heading to the de-facto reality pretext so as to generate a favorable terrain for such pro-fanaticism meetings,” the Foundation stated. The Foundation called on Palestinian masses and activist organizations to stage mass sit-ins in al-Aqsa so as to protect the sanctity of the Islamic site. “Al-Aqsa has been and will forever be Muslims’ own and exclusive property. Our ancestors have been performing their prayers here for years and we will go along their footsteps till our last breath. ‘Al-Aqsa ours, not yours!’ is both the starting point and the destination to which we will all be heading” the Foundation firmly declared. Israeli extremists vowed death to Palestinian Christians if they do not depart from 1948 occupied Palestine within a week’s time. Palestinian sources in Nazareth city, north of 1948 occupied Palestine, said on Tuesday that Jewish extremists delivered a threatening message targeting Palestinian Christians and ordering them to leave the country within the prescribed deadline. The sources said that an Israeli extremist delivered the threatening letter at the home of a Christian bishop in Nazareth last night targeting the bishop and all other Christians. “Adherents of the Christian religious faith, from top to bottom, have until 05 May 2014 to leave the country. The deadline is non-negotiable and every single hour of delay will cost you the lives of 100 Christians,” the letter scrawls. It singled out, however, the followers of the Protestant and Anglican churches. Israeli police claimed they had arrested an extremist Jewish settler, in his 40s, from Safed and averred investigations are going on with the suspect, who was described as one among a group of settlers that sent the letter. Vandals left anti-Muslim graffiti on a mosque in northern Israel, police said on Tuesday, the latest in a string of racist and religious attacks against Palestinians. "Unidentified people drew a Star of David and wrote 'close the mosques and open yeshivas' (Jewish seminaries) on the outer wall" of the mosque in Fureidis, Israeli police spokesman Micky Rosenfeld told AFP. "The tires of several cars parked nearby were slashed," he said, adding that "crimes committed for nationalist motives are extremely serious." 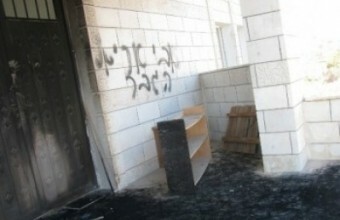 On April 18, suspected Jewish extremists set fire to a mosque and sprayed racist graffiti in the town of Umm al-Fahm. Slogans including "Mary is a cow," "price tag," and "America (is) Nazi Germany" were sprayed in Hebrew on the walls of the Roman Catholic sanctuary. In March, vandals slashed the tyres of more than 40 cars in East Jerusalem, spraying a slogan reading: "Gentiles in the land are enemies." Right-wing Jewish organizations distributed a leaflet across Jerusalem Monday urging Jews to join an emergency conference to discuss means to secure a Jewish presence inside the al-Aqsa compound. The conference, according to the leaflet, will be held Tuesday at the Menachem Begin Heritage Center in Jerusalem to address how to guarantee a Jewish presence inside the holy place and to force Israeli police to open all gates to Jews and allow them to perform Jewish rites freely. 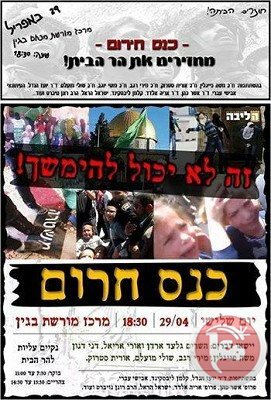 The leaflet reads that workshops and panels will be held to listen to suggestions on how to impose “complete Jewish sovereignty on the Temple Mount.” The leaflet claims that Jews, when they enter the compound, are being humiliated, detained, harassed and subjected to physical harm. Panelists in the conference include rabbis, Israeli ministers and Knesset members such as Moshe Feiglin, Orit Strook and Moti Yogev of the Jewish Home party as well as Miri Regev of Likud and Shlomi Moallem, according to the pamphlet. All Palestinian citizens of Kifl Hares, including women and children, jolted out of their beds in remarkable terror as a horde of Israeli settlers, backed by large numbers of Israeli occupation forces (IOF), invaded the village last Friday at a late night hour and performed provocative rites in such a frighteningly frenzied and hysterical manner. IOF were heavily deployed in the village’s streets, where fanatical shouts and offensive slogans, aiming at insulting Arabs, have been heard. Shrines in Kifl Hares have always been permanent target of settlers’ Judaization schemes, despite their undeniably pure Islamic origin. Israeli settlers have been frequently invading our village under the religious pretext, Kifl Hares natives told the PIC correspondent. “What on earth is religious about such misdemeanors? Can anyone here, or anywhere else in the world, tell me what is religious about knocking our door bells at late night hours and kicking our house gates with boots just to frighten our children and women? How could anyone dare commit such felonies under the religious pretext!” Bouzaya wonders. More than four thousand dunums have been confiscated by IOF in Kifl Hares in favor of a main road. Gangs of extremist settlers, estimated at around 20 thousand on certain nights, invade the town around 25 times a year under IOF protection with unjustifiable curfews imposed from 9 pm to 5 am. According to Abu Yaakooub, such barbarian attacks frequently conducted against Palestinian holy sites have no connection, whatsoever, to religion. “Theirs is just faithless!” Abu Yakoub declares. Abd Al-Kaher Zaher Shakour, a Palestinian citizen, called on the international community and human rights organizations, nationwide and overseas, to react so as to immediately bring such military-backed settler violations to a halt, adding that citizens’ lives are in constant danger due to such practices. The vicinity of the Aqsa Mosque saw Monday morning high tension between Palestinian natives and Israeli policemen after the latter prevented them from entering their mosque unless they turned in their IDs. One of the Mosque's guards reported that the situation in the Old City of Jerusalem was likely to explode because of the Israeli police restrictions on the entry of Palestinian worshipers to the Aqsa Mosque. The guard added that a large number of students at the Aqsa schools were subjected to minute search and some of them refused to go through any Israeli measures restricting their entry to their holy Mosque. 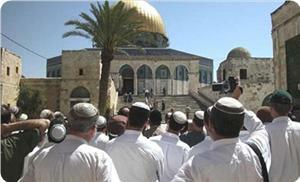 The Israeli police, however, allowed 15 fanatic Jewish settlers to defile the Aqsa Mosque in the morning. Consequently, hundreds of Palestinians organized rallies outside the gates and entrances of the Aqsa Mosque to protest these Israeli police measures. Al-Kakal a Zionist organization is launching a cold war through buying the Palestinian lands secretly in a way similar to Mossad’s. 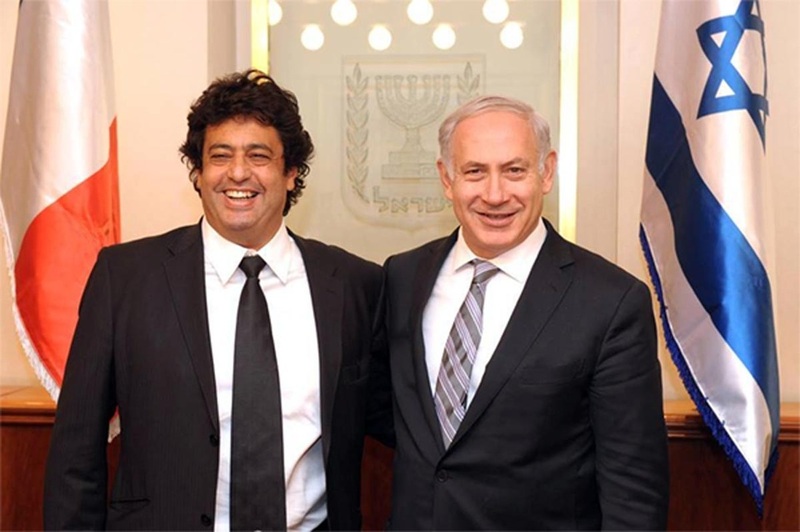 Israeli channel 10 revealed that the organization appoints an Arab deputy, his name is kept anonymous, to buy Negev lands and gave him in return large amounts of money. 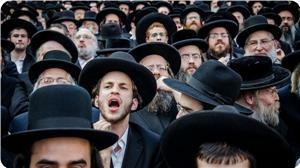 The channel reported that there are serious corruption issues inside al-Kakal including scam, exploitation, buying receivables within the institution called "Jewish National Fund" (JNF). “Kakal owes 12% of the Palestinian lands as a private property. No Governmental or judicial party dare to object it or use the lands it controls.” Head of the popular committee for the defense of land and housing Ahmed Melhem said. The Kakal was established in 1901. It is specialized in collecting the funds to buy the Palestinian lands for the construction of Israeli colonial settlements. Israeli settlers on Monday destroyed over 150 olive trees belonging to Palestinian farmers south of Nablus, a Palestinian official said. Ghassan Daghlas, a PA official who monitors settlement activity in the northern West Bank, told Ma'an that a group of settlers from Yitzhar raided the Huwwara village and cut down over 150 trees. The trees belonged to Nayif Khadir Audah, Ghazi Dawood Salim and Fatima Audah and some were located on property belonging to a local mosque. 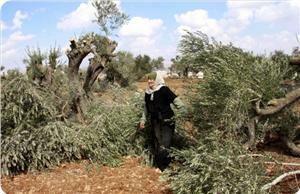 On Sunday, settlers destroyed over 60 olive trees in Huwwara using chainsaws. More than 60 fruitful olive trees were uprooted by Israeli settlers in Hawara village, south of Nablus, on Sunday morning. 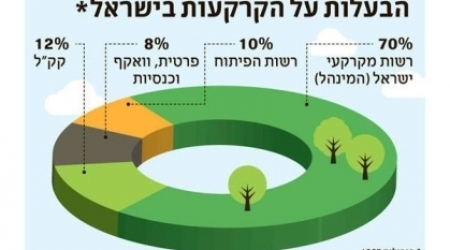 Ghassan Daghlas, the official responsible for monitoring settlement activity in northern West Bank, said a number of Yitzhar settlers uprooted the trees using power saws. In the same context, Israeli settlers attacked a Palestinian farmer from Bethlehem south of the West Bank. Local sources said that a group of Efrat settlers invaded the lands of Palestinian civilian Yahya Ayesh, 55, using dogs and horses and damaged several wheat and barley crops. According to the same sources, Ayesh was subject to brutal physical assaults after the Israeli invaders unleashed dogs and beat him up. In another incident, an Israeli settler ran over a Palestinian farmer from Bethlehem on Sunday while he was on his way to work in his land using a donkey. Local sources told the PIC correspondent that the elderly farmer Ismail Moussa Abu Sheikh, 70, was left severely wounded before being carried to hospital for treatment. Along the same line, Radio Israel reported several Israeli extremists wrote racist slogans reading as “Death to Arabs” on the walls of a school in Akka in 1948 occupied Palestine. In another event, local Palestinian sources reported that Israeli settlers smashed in the glass windows of a Palestinian home in the Old City in al-Khalil so as to pressure its Palestinian owner to abandon his house. 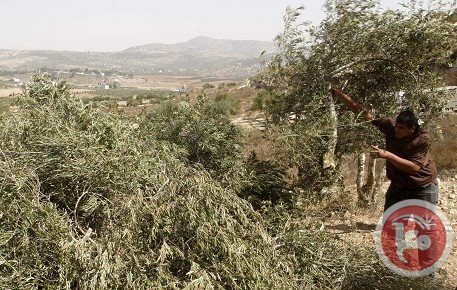 Settlers from the Israeli settlement of Yitzhar on Sunday chopped down more than 60 olive trees belonging to Palestinian farmers south of Nablus in the northern West Bank. 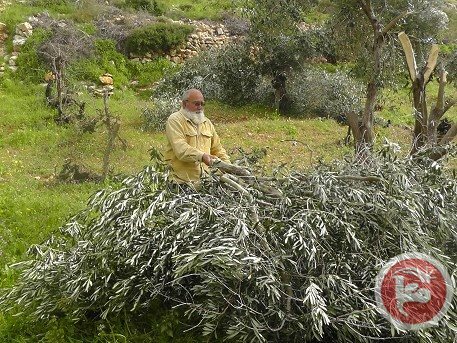 Ghassan Daghlas, a Palestinian official who monitors settlement-related activities in the northern West Bank, told Ma'an that a group of settlers raided a neighborhood known locally as Al-Luhuf and chopped down more than 60 olive trees using chainsaws in private fields in the village of Huwwara. Ghassan Daghlas said that the fields belonged to Murad Tawfiq, Bashir Audah and his brother Audah as well as Nayif al-Zeifa. Israeli police detained two Jewish teenagers recently after they posted an inflammatory sign on a gate of the al-Aqsa mosque compound, Israeli police said. A statement by Arabic-language Israeli police spokesperson Luba al-Samri said that the suspects posted an inflammatory sign on one of the main gates of the al-Aqsa mosque compound urging Muslims to evacuate the Al-Aqsa mosque so that Jews can build a Jewish temple in its place. Al-Samri added that the suspects would be referred to prosecution for legal procedures as a result of the act. One of the suspects is 18 years old while the other is a minor, according to the statement. When the two were arrested, police found more fliers similar in their content on their persons. The Al-Aqsa compound, which sits just above the Western Wall plaza, houses both the Dome of the Rock and Al-Aqsa mosque and is the third holiest site in Islam. It is also venerated as Judaism's most holy place as it sits where Jews believe the biblical First and Second Temples once stood. The Second Temple is believed to have been destroyed by the Romans in 70 AD, and some right-wing Jewish groups call for the destruction of the Al-Aqsa mosque and the erection of a "Third Temple" in its place. Palestinian guards foiled Saturday evening two Israeli settlers' attempt to infiltrate the holy courtyards of Al-Aqsa Mosque, handed them over to the Israeli occupation police. 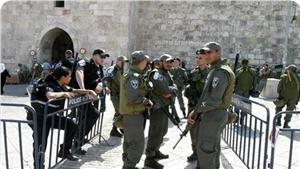 According to eyewitnesses the settlers tried to deceive the guards by claiming that they are Muslims. 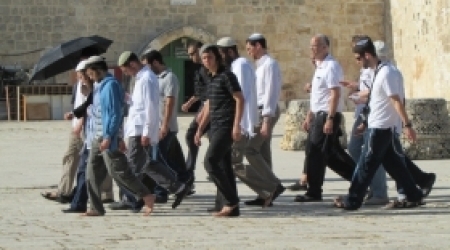 Several attempts of Israeli settlers disguised as Palestinians to Storm Al-Aqsa Mosque were thwarted recently. Jewish settlers and Israeli occupation soldiers stormed Al-Aqsa mosque as almost daily routine, in light of the silence of Arabic and Islamic world. 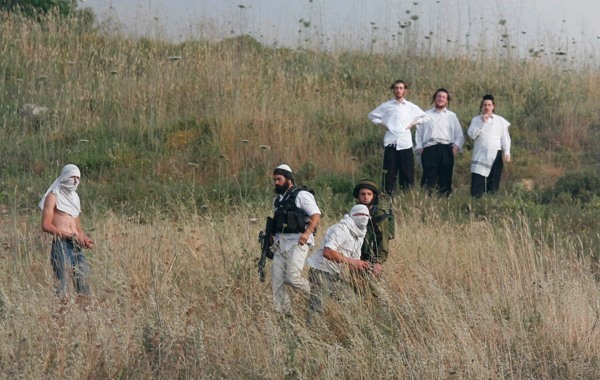 A number of extremist Israeli settlers attacked a Palestinian farmer in his own land, near Wady Rahhal village, south of the West Bank city of Bethlehem. Medical sources said Mohammad Yahia Ayesh, 55, suffered various cuts and bruises, and was also mauled by a dog owned by the settlers. He was left also suffering an anxiety attack. Hasan Breijiyya, coordinator of the National Committee against the Wall and Settlements in Bethlehem, told the WAFA news agency that the settlers came from Efrat settlement, illegally built on Palestinian lands south of Bethlehem. Breijiyya added that the settlers, riding horses, invaded the land of Ayesh, and attacked him when he demanded them to leave. The land is planted with wheat and barley and is located in the Khallit an-Nakhla area, near Wady Rahhal village. Breijiyya stated that Palestinian lands in the area are subject to frequent attacks by Israeli soldiers and settlers as Israel is trying to illegally confiscate them for its illegitimate settlement expansion activities. 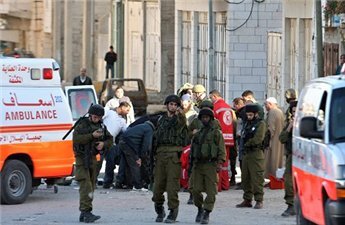 Earlier on Sunday, soldiers invaded Palestinian communities in the Hebron district, in the southern part of the West Bank, and kidnapped three Palestinians. Local sources said the army invaded Tarqoumia town, west of Hebron, and kidnapped Mohammad Hasan Abu Dabbous, 26, and Mohammad Sa’id Abu Dabbous, 31. Soldiers also invaded the as-Sammoa’ town, south of Hebron, and kidnapped Raed Abul-Nabi Hawada, after they broke into his brother’s home and searched it. 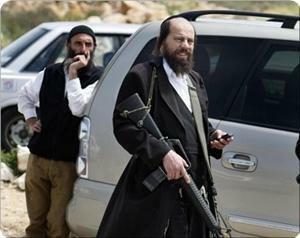 A Jewish settler tried to run over a Palestinian citizen south of Nablus on Saturday night. The PIC reporter said that the citizen was crossing the main road in Hawara village, south of Nablus, when the settler in a white KIA car deliberately headed towards him. He said that calls for caution were voiced in the village following the incident in which the man barely escaped unharmed. The Israeli newspaper Israel Hayom reported, on Wednesday, that the French government has halted the transfer of donations worth €3,000 to an Israeli association operating in the Gilo settlement, in occupied Jerusalem. According to the newspaper, the Middle East Monitor reports, French parliamentarian Meyer Habib, who was elected to a seat representing French citizens living in several foreign countries, including Israel, said that he had previously received permission from the French government to support the Israeli association; therefore, he was surprised at the latest decision to prevent the transfer of funds on the grounds that the association in Gilo is located beyond the 1967 borders. In December, Habib reportedly received an approval to make a financial contribution to the Daat Menachem association that supports French-Israeli students studying in Jerusalem. Curiously, in recent news, with his appointment as France’s new prime minister, there has been renewed attention to a 2011 video of Manuel Valls declaring that he is “eternally tied” to Israel, and expressing Islamophobic views.